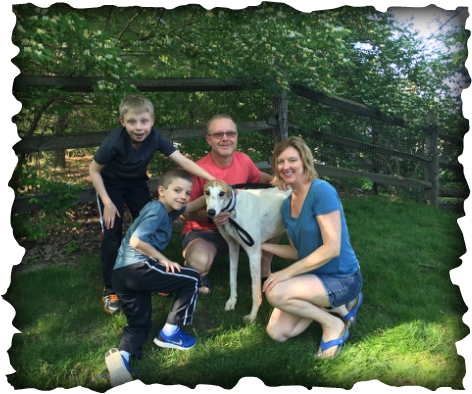 JJ Jolly, now Nikko, was adopted by Jennifer, Chuck, Max, and Aiden of Loveland. This family has only had cats and had always wanted to add a dog to their family. After a lot of thought they waited until everyone was ready and decided that a greyhound would be the perfect dog for them. Nikko walked right in and felt like he was home- he explored all the rooms and loved being by the boys. This pup is going to get tons of attention and we will definitely be seeing all of them at events this summer!